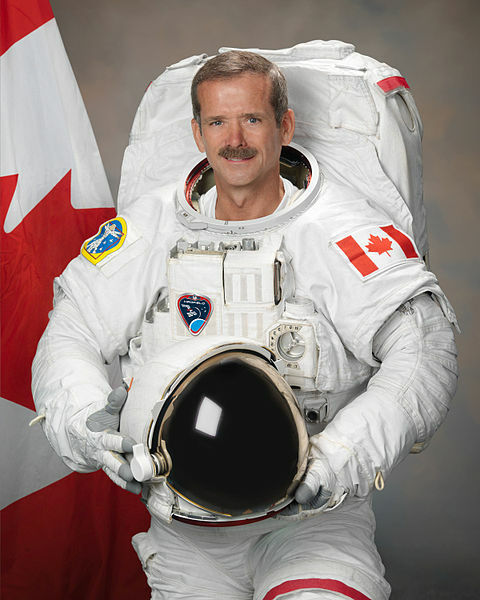 Canadian Astronaut Chris Hadfield recently published a new book called An Astronaut’s Guide to Life on Earth. I haven’t read it yet, but I’ve been interested in taking a look. Having seen Hadfield in his broadcasts from space and in television interviews here on earth, I’ve had the impression that he’s not only very intelligent, but also a really good guy who cares a lot about people and making the world a better place. It wasn’t any surprise then when I asked my cards, ‘what is the nature of Chris Hadfield?’ and pulled the Knight of Cups in response. This Knight is a man on the go. Compassionate and forward moving, he extends love and good will to all he meets. He encourages us to be creative, friendly, and to follow our hearts. The Knight of Cups is practical though, wearing a suit of armour under his attractive tunic, and if the wings of mercury on his helmet and heels are any indication, he’s quick thinking and actively focused as well. 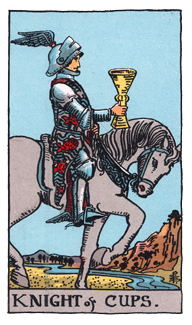 Like all the Knights in Tarot, the Knight of Cups is actively participating in creating his own life. As part of the Cup family, his particular motivation comes from the heart. The Knight of Cups couldn’t have said it better himself. And it’s good advice for all ages. You are currently reading An Astronaut and the Knight of Cups at The Tarot Room.